The Arduino platform is one of the most widely used hardware and software environments for developing and prototyping new products. Using various shields and breadboard techniques ,the Arduino platform allows for fast prototyping. However, using a Arduino development board in your finalized product is far from ideal. This article will break down the Arduino Uno schematic and go over how to integrate the hardware into your new product directly. Below is the Arduino Uno reference design which can be found on Arduino’s website here. When you upload a sketch or compiled program to the Arduino Uno this is the part that is getting programmed. The ATmega328P-PU has been the core of the Arduino hardware platform since the very beginning. Here the ATmega328P-PU is basically pined out to headers, has its ICSP (more on this later) port exposed, a 16MHz crystal, and the power bypass capacitors. 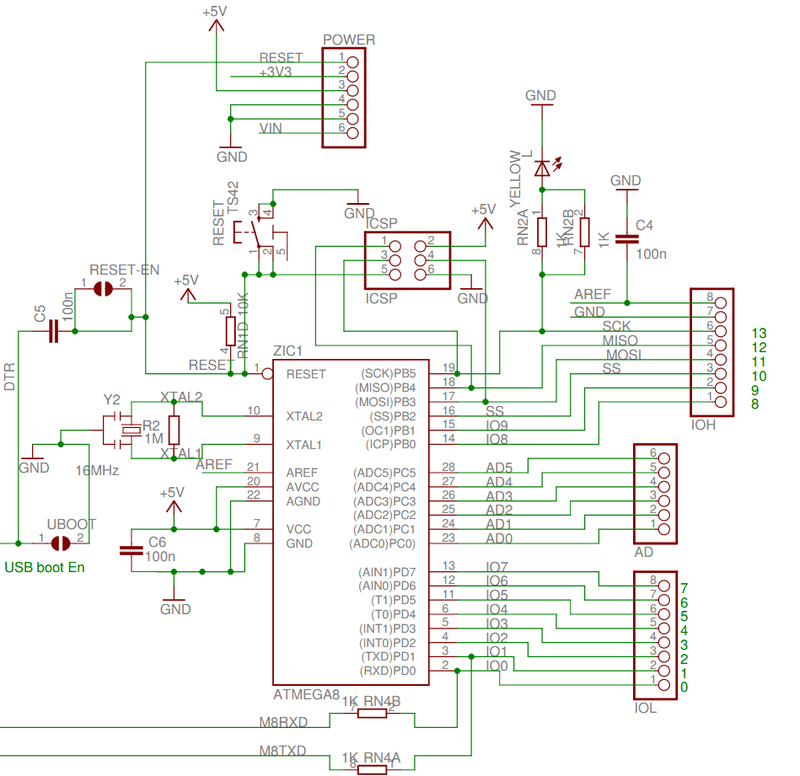 Arduino decided to roll their own USB to Serial bridge on the Uno by using an ATmega8U2-MU microcontroller. The ATmega8U2-MU has dedicated USB hardware I/O but is limited in program and data memory size compared to the ATmega328P. All this part of the circuit does is take the differential signaling from the USB connection and convert it to a serial signal that the UART on the ATmega328P can understand. The main power supply circuitry for the Arduino Uno is +5.0V DC as the ATmega328P-PU and ATmega8U2-MU require this to operate. Interestingly, the UNO has two MC33269 LDO regulators on the schematic, a MC33269ST-5.0T3 and MC33269D-5.0. Why two LDOs? Well a look at the Arduino Unos layout file in Eagle shows that IC1 and IC2 share the same footprint. This must have been done to document part substitutions if one of the packages was out of stock. Looking at the MC33269 datasheet shows something interesting about these part numbers. The MC33269ST-5.0T3 (IC1) is a SOT-223 package and fits on the footprint. The MC33269D-5.0 (IC2) is actually a SO-8 package and won’t fit on the footprint on the PCB. Assuming this is just a typo and not a wrong part number the MC33269DT-5.0 is a DPAK package that also fits on the footprint. To prevent the DC jack from being wired up incorrectly, the diode at D1 provides reverse bias protection. For a +3.3V DC rail there is a LP2985-33DBVR LDO regulator. On the Arduino this regulators sole purpose is to provide a reference voltage to the power switcher/muxing circuit. This does not take a lot of power to do so the majority of the regulators 150mA current capacity can be used for powering up small external circuits and sensors. This is the most interesting part of the Arduino Uno schematic. This circuit determines if the Arduino Uno is going to pull power from the DC jack or from the USB connector. I simplified and consolidated the original schematic into the schematic below. Powering the Arduino can happen two different ways. One way is to provide the USB connector with +5.0V DC and the other way is to provide +7.0V DC to the DC jack. If the USB connector is powered with +5.0V DC and the DC jack has less then +7.6V DC then the circuit works the following way. The internal diode in the T1 P-channel mosfet drops the voltage to ~ +4.3V DC. This ~ +4.3V allows the LP2985 (U2) to output +3.3V since it has a ultra low drop out of 7mV at low current. This also turns on the LM358D (UA1) opamp. This opamp is setup as a comparator. Since the voltage from the DC jack is below the cutoff set by the voltage divider (RN1B and RN1A) and the +3.3V power line, the LM358D drives the gate on T1 low which allows current to flow and raises the ~ +4.3V DC coming out of T1 to closer to +5.0V DC. If the voltage on the DC Jack is greater then +7.6V DC then the circuit works the following way. The +7.6V or greater voltage looses 1V due to the diode D1. This reduced voltage then goes into the MC33269 (IC1 or IC2) voltage regulator and applies +5.0V to the power rail. This powers up the LP2985 (U2) to supply the +3.3V DC rail. The voltage divider (RN1B and RN1A) halves the DC power input voltage to greater then or equal to +3.3V. The LM358 (U1A) then drives the gate on the T1 p-channel mosfet high which closes the mosfet and prevents back feeding the USB connector. In the case of Atmel microcontroller (or now Micromel microcontrollers) ICSP stands for In Circuit Serial Programming also known as ISP. This is a different way to program the microcontroller then the way Arduino programs. ICSP uses external hardware (a ICSP programmer) to communicate to the microcontroller and load compiled code onto. Arduino uses the USB interface and a small program that runs at start up on the ATmega328P called the bootloader. This bootloader looks for serial data coming over the USB to serial bridge. If it sees the correct data it will then load it into its program space. Using the ICSP interface to program your Arduino or ATmega328P you can load different Arduino bootloaders or remove it all together to gain more program space. There are three main reasons to integrate the Arduino board you are using to prototype into your product directly. Official Arduinos are pricey and the clones still cost more then just a bare ATmega328. Having to add though hole headers to your PCB to connect to the Arduino like a shield also raises the cost. There is also additional assembly time needed to assembly your stack up inside your product. Removing the Arduino will reduce the complexity of your supply chain. Instead of having to source the Arduino you can just order the ATmega328P directly from the supplier of all the other electrical components you are using for your product. An unlikely (in the near future) but real scenario could be if Arduino phased out the Arduino UNO that you use for your product. This in my opinion is the most important reason to integrate the hardware into your product directly. The headers and shield nature of the Arduino platform makes for bulky PCB stackups. Integrating the hardware will allow you to get your product down to a single PCB in most cases which will reduce the overall size of your product. Ok we are going to integrate the Arduino into our product. To start we should look at what it takes to get a stand alone ATmega328P running. Assuming you are providing the +5.0V DC power already you only need the following 5 parts. If you want to learn how to run the ATmega328P without an external crystal take a look here. Does Your Product Use the USB Interface? If your product uses USB for communication consider using the following dedicated USB serial bridge ICs: FT230X, CP2102. These ICs are less expensive then the ATmega8U2-MU microcontroller that the Arduino uses for USB to UART and typically do not need any configuration or programming to get working. Another solution is to prototype with a USB Native Arduino board like the Leonardo. The Arduino Leonardo uses an ATmega32U4. A consideration before making this change however is that the ATmega32U4 microcontroller has slightly less program space and ram compared to the ATmega328P when the bootloader is installed. This is due to the USB programming stack in the Leonardo’s bootloader taking up more space. The ATmega328P-PU is the DIP or through hole version of the IC. Atmel makes the ATmega328P-AU which is the QFN surface mount part. The AU part is slightly cheaper per unit, will be much less expensive to assemble, and takes up less board real estate then the PU part. Definitely consider switching to this flavor of the ATmega328P when integrating Arduino. As a bonus the AU also has two extra I/O pins that the Arduino software supports. There is also an Arduino UNO SMT version but it does not break out these two extra I/O pins. Most products only have one way to power the device. If you are a strictly USB powered device you do not need to use the power switcher/muxing circuit.Devices that are powered of replaceable batteries do not have to worry about this as well. Devices using internal rechargeable batteries like lithium will need a way to charge the device and operate at the same time. There are lots of different single IC solutions for this but I have personally used the Ti BQ24075RGTT in the past and it works well. Does your product even need the Arduino bootloader? The bootloader allows easier programming over USB instead of having to use an ICSP programmer. If your device is not intended to have firmware updates in the field then you will not need the bootloader. I always recommend designing your product to be programmed in the factory by ICSP as it tends to be faster and more reliable. When you use the Arduino IDE to “Upload” the file it actually recompiles the software every time which is fairly slow. You can use the ICSP header and programmer to pull an “image” of the hex file off the ATmega328P and then use this image to program all your production devices over ICSP. To reduce your number of line items and assembly cost consider using a programming cable like tag-connect. Take a look at this article on our blog about how to design your PCB for these kind of cables. That should complete the break down and explanation of the Arduino UNO hardware. 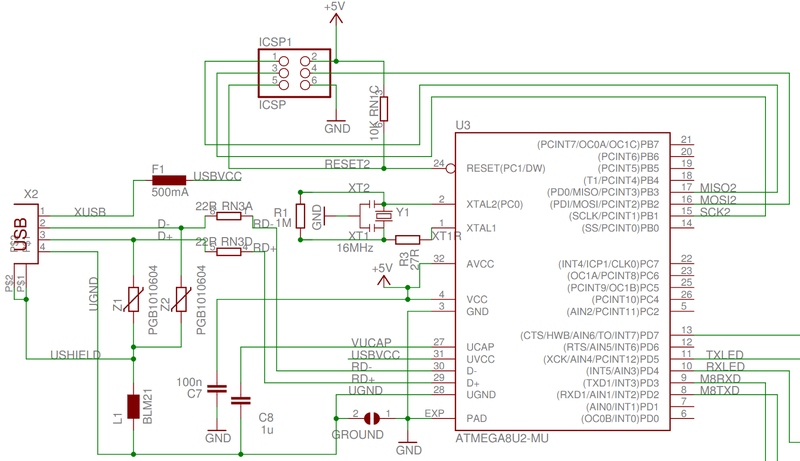 If you want more information about designing and building an ATmega328P-AU (SMT version) based development board that uses tag-connect check out the article Getting started with Tag-Connect on an AVR MCU. Also check out the Macro Duino which is a Duino compatible development board I developed that uses a FT230X for the USB UART bridge and a USB Type-C connector. The Macro Duino was discussed on podcast episodes MEP EP#31: Embedded Brewing with Arduinos, MEP EP#35: Surgical Synthesizers, MEP EP#36: Cloud Net, MEP EP#37: Banned Arduinos and Tuning Software By Ear, and MEP EP#40: Update on the MacroDuino and FX DEV Board so go give those a listen.  If there is anything I missed or have any questions let us know in the comments below or bring it up in our MacroFab Slack channel where we discuss all things related to PCBs, hardware, software, and MacroFab!